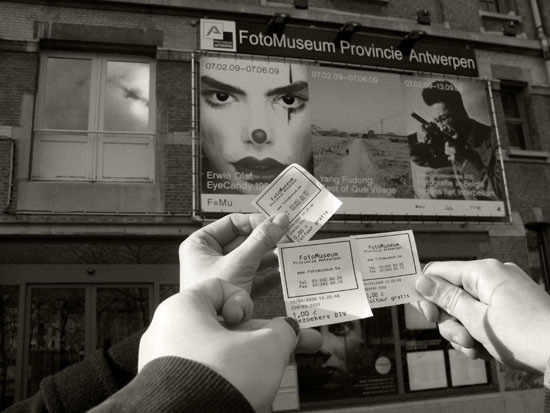 Last Thursday Erwin Olaf was at FoMu giving a lecture on his photography throughout his almost 30 year carreer. I didn't have a ticket to get in but gave it a shot. I was lucky. Some no shows and Stijn Huyghe's 2€ (thanks mate) allowed me to get in.It was fantastic to see (and hear) the evolution Erwin went through. How his personal work impacted his professional work. How people around him impact the outcome. How technology allowed Erwin to try new things. How old work influences new work (thank you for the inspired 'Blacks' preview). How budgets make a difference. How creativity and vision lead to what you want to acheive as a photographer.